SAN FRANCISCO, CA — Breast Cancer Action (BCAction), the watchdog of the breast cancer movement whose mission is to achieve health justice for all women at risk or and living with breast cancer, has released “Should I Get A Mammogram?” Understanding the Harms and Benefits of Routine Breast Cancer Screening.” This balanced discussion of screening is the first of its kind and fills an urgent and unmet need in women’s health. Breast Cancer Action’s screening brochure provides information about breast cancer screening for women of average risk who don’t have a family history of breast cancer, have not been diagnosed with breast cancer, and have no other known risk factors. According to the Swiss Medical Board commentary published earlier this year in the New England Journal of Medicine, 21.9% of breast cancers found via mammography screening represented over-diagnosis. This means that one in five women who was told she had breast cancer after mammography screening received unnecessary treatment. 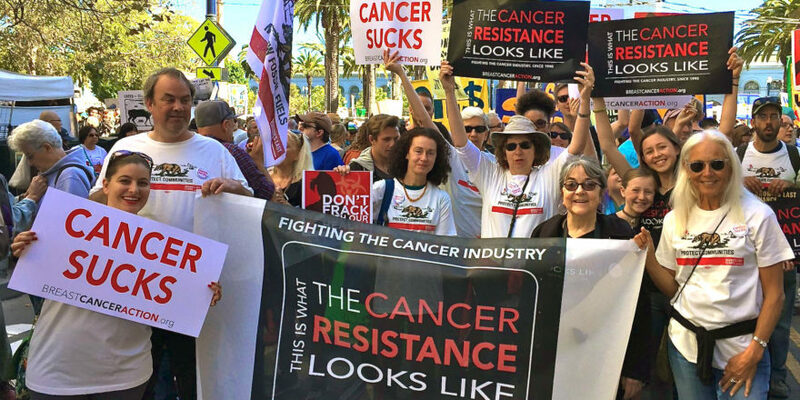 The implication of these results is that tens of thousands of women in the U.S. each year undergo surgery, radiation and chemotherapy for non-life threatening cancers. 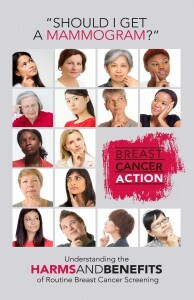 Breast Cancer Action (www.bcaction.org) is a national non-profit education and advocacy organization that avoids conflicts of interest by refusing funding from the “cancer industry,” including pharmaceutical and chemical companies, enabling them to retain an independent voice and offer truly unbiased information about breast cancer.